Get out your rolling pins, it's Daring Bakers time again. This month we've made puff pastry! The September 2009 Daring Bakers challenge was hosted by Steph of A Whisk and a Spoon. She chose the French treat, Vols-au-Vent based on the Puff Pastry recipe by Michel Richard from the cookbook Baking With Julia by Dorie Greenspan. Puff pastry does take a lot of time to make but the steps are fairly easy. I won't lie to you, there is an awful lot of butter in this recipe. OMG - the butter, but what you end up with is layers and layers of flaky melt in your mouth goodness. As Julia Child used to say, "Everything in moderation, including moderation." The puff pastry is used to create vols-au-vent, which are little puff pastry cases designed to hold a filling. I decided to create a sweet filling for my vols-au-vent as I was taking them to share at a birthday party. I filled them with a cinnamon pastry cream. I topped the luscious cream with sliced peaches, mint and a dusting of cinnamon. Sweet, sophisticated and oh so good. The recipes for the puff pastry and vols-au-vent are a little long, here’s a printable link to the recipe for both. Steph was also able to find an online video from the PBS show “Baking with Julia”. In it, Michel Richard and Julia Child demonstrate making puff pastry dough. It's quite entertaining. Thank you Steph for a great challenge and I encourage all of you to give it a try. Be daring! 1. In a bowl, whisk together egg yolks and 1/4 cup of the sugar for 2 minutes or until pale yellow. Adding flour in 3 additions, stir until well mixed. 2. In a saucepan, heat the milk, remaining sugar and cinnamon sticks over medium heat, stiring often until the sugar is dissolved and small bubbles begin to form around the edges of the pot. Stiring constantly, pour about 1/3 of the milk mixture into egg mixture and stir until thoroughly combined. Pour egg mixture into remaining milk and cook, stiring, for 3 to 4 minutes or until mixture begins to bubble. Reduce the heat to low and continue cooking, stiring, until mixture begins to mound and hold its shape; remove from heat. 3. Stir in butter and remove the cinnamon sticks. Transfer to a bowl, cover with plastic wrap touching the surface of the custard and cool to room temperature. 4. Beat whipping cream until stiff; add a large dollop of cream to the cooled pastry cream and fold in; add remaning whipped cream and fold in until almost combined. Place in the refrigerator until completely chilled. i'm a little in love with the flecks of cinnamon in this concoction... you're the first sweet vols au vent i've seen and it's lovely. awesome job! Beautiful and I love the filling! Yours turned out so nice and puffy. Just perfect! Yours are definitely impressive! I'm sure you wowed them at the party. Great job! that is gorgeous sweetie! nicely done! Yumm. Cinnaomon cream. I think every great baker should make their own puff at least a few times in their life. Actually turns out cheaper. drooooooool ... :) That looks AMAZING. Great job. Your vols-au-vent look delicious. Congrats! your puff pastry did puff enough, look at all this lovley layers. Very well done! Your pastry is nicely puffy! Your pastry is beautiful and the cinnamon pastry cream sounds soooo good! Cinnamon and peaches, mmmm! Brilliant, and looks beautiful. You make intimidating recipes look so effortless! So pretty! Love the cinnamon pastry cream =D. Gorgeous job! cinnamon pastry cream sounds and looks fantastic, great pastry too! Yum, your pastry cream looks divine, great job on this challenge. Too good, puff pastry have risen beautifully! Gorgeous, Paula! And I love the cinnamon cream - mmmm! Those look lovely! I love the idea of cinnamon cream, yum, perfect for fall. Your vols-au-vents look great and I love your cinnamon pastry cream. Nice job on your challenge. Thanks for stopping by my blog. Lovely pastries! I'm sure they were very impressed at the party. Paula.. your vols have puffed soo beautifully!!! great post..
great job. super fluffy. and the peach/ cinnmamon combo sounds good. Gorgeously done and the layers look so flaky. Great clicks as well. Oooh cinnamon pastry cream? Yum! Your puffy pastry looks absolutely cuddly! Great job! That cinnamon pastry cream looks amazing! And with sliced peaches - yum! Awesome job with these! Very nice photos! The cinnamon pastry cream sounds delicious. Wonderful job on the challenge! Amazing job Paula, and I think you need to be forced to do stuff like this. Boy, are you good at it or what? Brilliant puffs & delicious filling. Cinnamom pastry cream...wow! I love the specks on top! I love your cinnamon pastry cream! 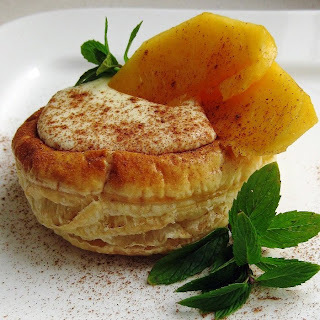 Your puff pastry looks beautiful - I love the cinnamon pastry cream - I am going to save that recipe for the next time I make puff pastry (which will be very soon, I'm sure!). Yum, delicious looking. It was the tail end of peach season here this month, and I can just taste it now! Gorgeous! the cinnamon pastry cream sounds wonderful! They are stunning! Congratulations on mastering puff pastry! Nice choice for the filling. I like the close-up with the single specks of cinnamon on the top crust. The cinnamon cream sounds so good. And I love that Julia Child quote! 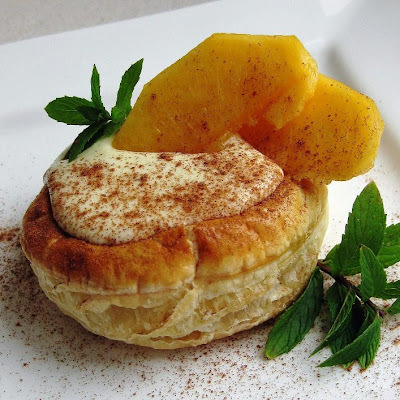 Oh now that pastry cream sounds delicious- And a perfect pairing with those peaches! Your Puff Pastry & V-A-V looks delicious with that cinnamon pastry cream...well done. I am slurping it off my monitor screen and have wet the keyboard all due to your fault :p. Thanks for sharing...will try it out one day. Wow! What beautiful puffy pastries! Your vol-au-vents look gorgeous and sound even better. Mmm.. cinnamon pastry cream with peaches! That sounds so good! Your vols au vent turned out beautifully. Lovely photos! 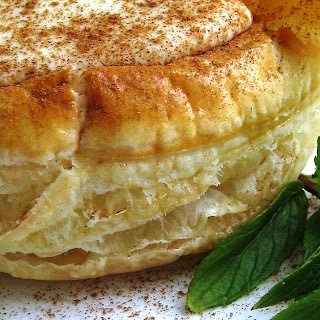 Cinnamon pastry cream sounds delicious and very creative! So very sophisticated. Gorgeous presentation of grand French cuisine. I have never liked vols-au-vent's but this just sounds amazing. Anything with cinnamon gets me straight away. Cinnamon is definitely one of my favorite flavors, these seem perfect. Great job! Gotta love anything with cinnamon! Yummy ideia! Oh wow these are beautiful! I love the flavours, such wonderful little treats yummy! That cinnamon cream looks absolutely wonderful! Awesome job on the challenge. The cinnamon cream sounds delicious! I would have loved a cinnamon pastry cream but I was vetoed. Love your layers! Your cinnamon pastry cream makes my mouth water. And your vols au vents look so perfect! Peaches and cream dusted with cinnamon sounds amazing. Gorgeous pastry as well. Paula your puff pastry is gorgeous. This is something I've always wanted to make but never have, I'm terribly jealous of yours! looks wonderful i must start to include my sweets for my blog! !